After retiring from his "day job" as a supervisor in the offices of the Los Angeles County sheriff's department, Ernest Baker was encouraged by a cousin to resume his professional music career. The singer recruited a band through classified ads in local papers and began working in clubs in black areas of Los Angeles, playing a mix of R&B, funk, gospel and blues. Promoter and producer Randy Chortkoff hired Baker as the featured singer in a blues revue. Chortkoff assembled a group of some of L.A.'s best blues musicians and began booking King Ernest & the Wild Knights up and down the West Coast. A recording contract ensued, and King of Hearts, Baker's first compact disc, was released by Evidence Music in January. While researching the liner notes for King of Hearts, I spoke with Baker at length about a career that began 40 years ago and always seemed half a step short of taking off. "I was born on May 5, 1939, in Natchez, Mississippi, but raised right across the river in Vidalia, Louisiana. There was 11 children, and I'm number three. My daddy was a guitar player, and my grandfather and all of 'em had a Baker's Band Revue down South. They played all around Louisiana and in Mississippi. They had violins, and my great granddaddy was a violinist. And see, all those boys learned to play instruments -- they were violinists or guitar players. My daddy picked it up -- and it left off with my daddy. "They weren't playing no blues. Had to be a lot of country and western, and maybe stuff like Sonny Boy Williamson, some of the blues players like, 'Baby please don't go back to New Orleans, 'cause I love you so,' you know, that kinda stuff. I used to sit on my dad's knee. I remember singing that with him when I was around seven years old. And he'd go to all those honky-tonk places down in the South, and he'd be playing just with his guitar. He could play the slide guitar too 'cause he had something on his guitar that made it a slide guitar, and that's how he made all his money with that cup he had. I used to hold his cup for him. "He played mostly at parties and juke joints and private little things for the whites in my home town and Ferriday, Louisiana, only nine or 10 miles away. That's where Haney's Big House was. That's where all the blues first got started down in Louisiana. Back during that time B.B. King, Ivory Joe Hunter, guys like that played there. My dad loved those guys. He loved Percy Mayfield, too, back when I was in school. He really liked Percy Mayfield." Though Baker snuck away to perform occasionally in the clubs down by the river, he was a popular student in high school, active in drama, acting and sports. He was in college studying math when his brother-in-law talked him into getting into music in Chicago. "My first professional gig in Chicago was at Wynn's Lounge in 1958 with Byther Smith. Byther was the first real professional guitar player I played with in Chicago. He saw all the potential. He always told me that I was going to be rich. I'd say, 'Golly, I wonder when it's going to happen?' But I can remember him telling me that back when I was a teenager. That's who started me off, Byther Smith. "I first came in an all Mexican neighborhood around 18th and Halsted, over in that area. That's where I first lived as a teenager. I could walk right through the viaduct and come to Jewtown (the Maxwell Street Market), walk right through the viaduct. Yes indeed, come over there and see some of the blues guys. There was a guy over there by the name of Papa George -- there was a man could play that harmonica. I don't know what ever happened to Papa George, but he was a bad harmonica player. Well, everybody played over there in Jewtown, lot of different bands. I never would sit in out on the street, but I went to see them, 'cause I always liked it." 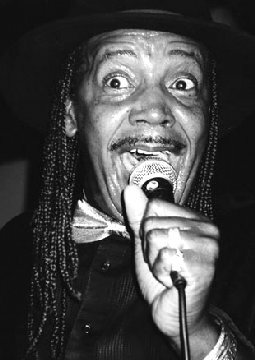 Baker recalls sitting in with various bands around Chicago on the same local circuit as Syl Johnson, Tyrone Davis, Artie "Blues Boy" White and Little Milton. On one particular gig at a club at 54th and Halsted streets around 1960, he filled in for Davis while he was out of town. When Davis returned, King Ernest had not only stolen the gig, but also Davis' girlfriend! His dynamic stage show kept him busy with engagements at clubs such as the Burning Spear and Roberts Show Lounge throughout the early '60s. "I left Chicago, going to New York in 1964, when I was in my early twenties. We ended up me writing a song titled 'I Feel Alright.' I remember trying to cut something before I left Chicago, a thing entitled 'Sitting and Watching.' And they never did release it. That was the first time I call myself trying to record anything. The demo was gonna be with Chess Records. We took the demo with us. Jimmy Peterson, he was our little manager, and he helped pay for the demo in the studio, 'cause we were all young with no money, 21, 22, you know, kids. But we ended up leaving, going on a little tour to New York, settling in New York, and that's how I ended up with Old Town Records. "And those guys on the road, they started saying, 'King,' calling me King. I was doing R&B, soul. They called me the King because I was so wild, you know, really wild. I mean James Brown. They said I could dance faster than him, you know, the leg movements and jumpin' off stages. And they just started calling me King, a wild little guy. "And so Hy Weiss, the president of Old Town Records back during that time, said, 'Well, let's just call him King Ernest then. Because see, when I left Chicago, I was 'Good Rockin' Ernie,' 'cause they say I was a house rocker. "I was working some of those clubs in North Newark, like Marsha's Lounge and Bernard's Place. That's where I met Wilson Pickett in 1964, before he started getting really big. He and I were down in North Newark at this place, and he asked to come sit in with me and my little group, 'cause we had the house packed. I used to dress with all the hair and different shiny suits and sparkles -- that's the way I looked back in the day. The women used to call me 'pretty Ernest.' Wilson said he wanted to come up on stage and sing with me. I said, 'Come on, man.' That little man got up there and sung. "And people was trying to find out who I was, and so I was doing a lot of James Brown, a lot of Jackie Wilson, Chuck Jackson. If I was going to sing something soulful, I would do something by maybe Tyrone Davis or Walter Jackson. And I would still make it really wild before the night was over -- do something by James Brown again. I used to do it at some of those clubs in the village like Gingerbread, Café Au Go-Go. I worked 'em all in the Village." Baker recorded a single, "I Feel Alright" b/w "I'm So Tired," for the Old Town label in 1965 that enjoyed some success and airplay. But eventually he felt that he had exhausted all his opportunities in the New York area. He moved back to Chicago in 1967 and put together a new band. "I really had a show when I came back to Chicago from New York. I got together King Ernest and the Soul Invaders. I had a horn section -- three horns -- and a rhythm section, a bongo player. I had a comedian that traveled with me by the name of Emmanuel Arrington. He's probably still around in Chicago. When I came back, my brother-in-law was a big instigator for me. That's Jerry Sims. He and Buddy Guy are real good friends. He's been a drummer for 40 years. He used to be one of the baddest drummers in Chicago back in the '50s and early '60s. "After I got back to Chicago, I didn't do any recording. I just traveled around doing all those club sets. I worked around Chicago about three good years, '67, '68, '69, '70. All through the '70s I continued to work places like the Skyway Lounge and High Chaparral, Ernie's Lounge. We even took a tour a couple of times through the South, through Louisiana, Mississippi. Oh God, they loved me down there." Baker recorded sporadically, with a handful of moderately successful singles for Mercury, Sonic, Barry and his own Blues Soul label. He moved to California in 1980 in hopes of recording an album, which led to another disappointment and an unexpected detour, career-wise. "When that didn't work out, and I was already out here, I got a job with the sheriff's department. I worked for the department for 14 years, and then reached 55 and retired and decided to come back in show business. "I've done a lot of gospel singing all around the South Central (Los Angeles) churches. A lot of people know me as Brother Baker. But more people know me for my soul music now, 'cause of the radio stations and all that stuff. And then we've done a lot of touring from Canada all the way to Utah, so I'm pretty well known now in Canada, Washington, Oregon, a lot of parts of California, out in Vegas, a lot of places in Arizona. "It's still in me, even at fifty-something. A lot of guys wonder how come guys fifty-some years old can't dance and do all that. You gotta remember, once you've done something, you never forget it. See, that dancing is still in my system. That's why at fifty-something I can still do all that stuff. A lot of guys, once they hit 55 or so, they stop doing everything, you know, unless you're James Brown or King Ernest. So we still do all that -- because it's in your bones, you know." This page and all contents are © 1997 by Blues Access, Boulder, CO, USA.